Prime Ski-in/out location in newly remodeled ROCK RESORT Grand Summit with access to Resort Amenities. Luxurious and spacious 1-Bedroom, 2-bath with separate Master Bedroom, Fireplace, Balcony and Bath. Stunning Mountain and Pool Views, Kitchen with Breakfast Bar and Eating area, Queen Sleeper Sofa, 2 Twin Window Beds and Bathroom with Shower/ Tub to name a few of its advantages. Enjoy the comfort and space of a condo but the luxury and convenience of a hotel. After a long day of skiing relax your sore muscles in one of the hot tubs or enjoy a fabulous massage. Heated pool, hot tubs, 24-hr gym, full-service Spa. Exquisite dining at the FARM and Red Tail in-house at Grand Summit will spoil your taste buds. 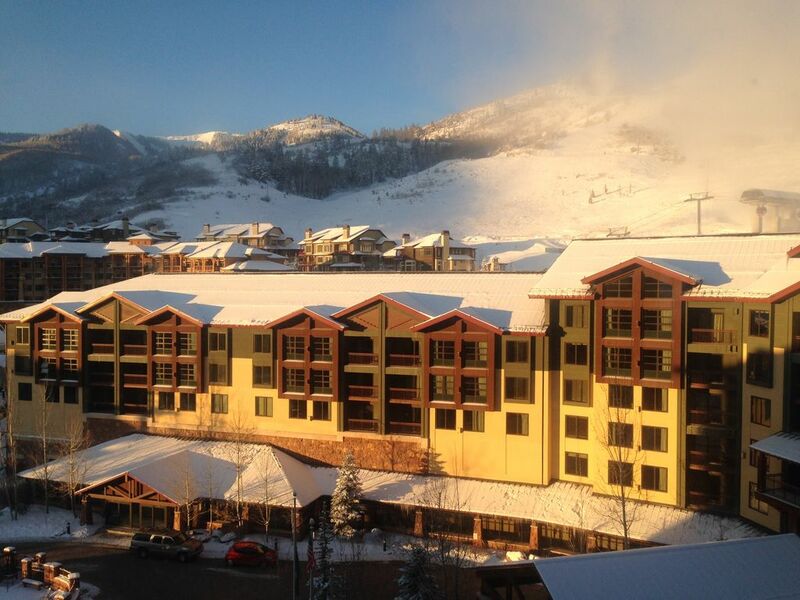 Located in the GS building is the award-winning child care and Vail Resort ski school. Please visit my review site to learn more about me and my services. Interested in Summer/Fall? Stay with us for a unique and memorable 4-Season Vacation and enjoy 300+ miles of mountain biking trails and some of the best hiking out West. Cool off in beautiful lakes, create awesome family memories white water-rafting and fishing, horseback riding, kayaking, golfing and/or biking. Visit Robert Redford's Sundance Resort nearby and hike to the Stewart Falls or explore the National Monument Cave 'Timpanogos' ... Your Options are Endless! We are an active family (2 kids ages 7 and 13 yrs resp.) and enjoy skiing, Mountain Biking, Hiking, Golfing, Kayaking, Fishing ... any outdoor adventure! Beautiful sunsets, crisp mountain air and blue skies, hiking with views on snow-capped mountains and the colorful beauty of the Aspens in fall make us happy! Canyons is our HOME away from HOME creating lifelong family memories. We fell in love with the place due to the ease of staying at the Grand Summit - making it a pleasurable and convenient location for family vacations. Its great ski-in/ski-out location, excellent ski school and child care program and the four season destination made it perfect for us. Not only travelers with children will appreciate the close drive to the Canyons coming from SLC airport. Accommodations are extremely spacious for families traveling with all that ski gear with the closest lift access possible. We love to watch the snow plows groom and prepare the runs whilst sipping our coffee in our deluxe room. The surroundings are marvelous! There is so much to do any time of the year - Summer, Fall or Winter! Different restaurants in the building, grocery store next door for your convenience ! Loved the condo. 6th floor which had a beautiful view and everything was brand new. We have stayed in the hotel for spring break 7 years in a row and this is by far the best condo. Additionally a lot of the hotel looks remodeled. I highly recommend it. Ingrid is wonderful as well. This condo is absolutely perfect. It is exceptionally clean and up to date. The shower and window day beds are amazing. The hotel staff is extremely friendly and helpful. The owner of this condo is exceptional. She went out of her way to answer any pre booking questions that we had. She checked in on us while we were there as well as when we returned home. I couldn’t have asked for a better owner and condo. Our overall experience was 5 STARS. Beautiful accommodations to match the location! We love this area, and the facilities are a perfect compliment, anytime of the year. It has become one of our family’s favorite get aways..,it’s also pretty great for just couples 😉�! We always love to accommodate you in one of our luxurious units with direct gondola/ mountain access. This 4 Season destination is ideal for couples, families or girlfriends’ retreats. Thank you for your trust. We had a great stay! The place was nice and clean. And my kids loved the pool and hot tub! Would definitely stay here again! We appreciate your business and are thrilled you enjoyed our fabulous, luxury and family friendly resort. The convenience of the Grand Summit ski-in/out combined with with all amenities of a 4* Resort made it our second home. Please visit us again and share with family and friends to receive a VIP discount on your next stay. Once again Park City did not disappoint & this unit was great! Teenagers loved sleeping in the window seats, plenty of room for the 5 of us to be comfortable & the view was great! Resort staff were also very kind and helpful. Highly recommend Park City & this location! It has been a pleasure to accommodate you in our oversized 1,000sf condo with marvelous Mountain Views. Check in was smooth. Easy self (or valet) indoor parking. Room was exactly as described. You can pay extra for housekeeping during your stay but it is not required. Otherwise, I just left the full garbage bags in the hall and they "disappeared". We had a leak from the shower the first day but maintenance came right away to caulk. When it happened again the next day, they came back and finally fixed it. They give you nice robes to use during your stay ($150 to buy them if you want). The master bed is one of those foam ones that some people like but others may feel a bit too soft. Great fireplaces. Large TV in the den with excellent cable programming. The master shower with a bench and two heads really hit the spot after a day on the slopes. The other bathroom was just as nice. Granite kitchen with everything I needed. A nice tile entryway for wet boots. The location is the best for dropping kids at ski school and the orange bubble. Although they have a ski valet in a room in the lobby, you still need to cross a sidewalk and carry your skis up a flight of stairs and through the lobby (maybe 50 feet) to check them. Another property, the Westgate, is a farther walk but they have valets on that sidewalk to collect your skis in a cart. One thing to note about the location: Since you are RIGHT at the mountain, you will hear the scraping of gates being put into place and the beeping of snowcats doing their work starting at 4 AM!!!! Bring earplugs. There is a beautiful outdoor pool but you can no longer access it from an interior room since they did reconstruction. So it is a bit cold coming in an out. The Westgate has an indoor/outdoor pool. The owners lounge has a pool table. The staff was all extremely nice and, overall, this was a great stay. Evan, thank you for staying with us. We appreciate your time submitting a detailed review. please email me directly to better understand what it would have made a 5* experience - other than more snow :-). We greatly strive to provide a superior customer experience and hope to welcome you back soon. Please inquire for last minute specials or promotions - a m rates serve only as indication Deposits are to guarantee your room and are non-refundable. Departure and mid week (4+ nights) apply and are paid to the hotel directly upon departure. Refunds (less deposit paid) up to 60 days prior to check-in only.